Podcasts Not Downloading On iPhone? Here's The Real Fix! 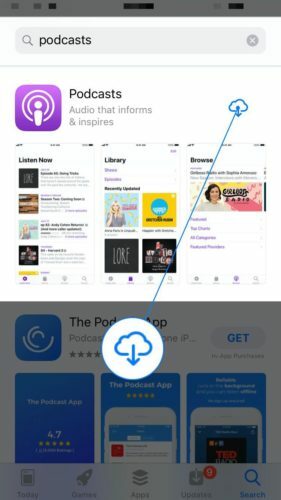 You are at:Home»iPhone»Apps»Podcasts Not Downloading On iPhone? Here’s The Real Fix! You want to listen to latest episode of your favorite podcast, but it won’t download on your iPhone. No matter what you do, new episodes aren’t downloading. In this article, I’ll explain what to do when podcasts are not download on your iPhone! Before we dive in any deeper, take a second to make sure that Sync Podcasts is turned on. If you downloaded your podcasts on iTunes, you’ll have to sync them to your iPhone before you can listen to them. 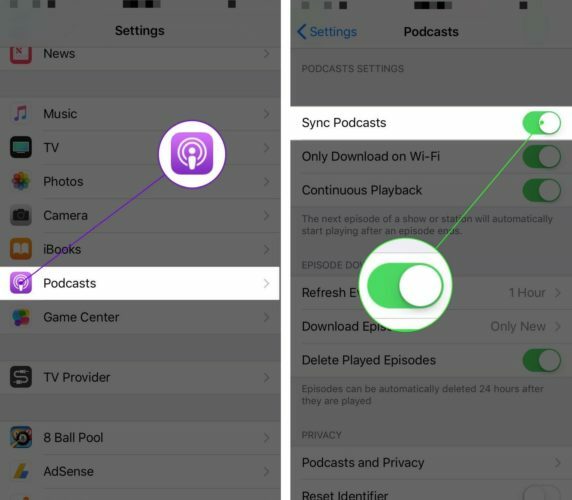 To make sure your podcasts are syncing to your iPhone, go to Settings -> Podcasts and turn on the switch next to Sync Podcasts. You’ll know Sync Podcasts is on when the switch is green. If Sync Podcasts isn’t on, tap on the switch to turn it on. Why Aren’t Podcasts Downloading On My iPhone? A lot of the time, your iPhone won’t download podcasts because it’s not connected to Wi-Fi. Many of the troubleshooting steps in this article will help you diagnose Wi-Fi related problems, but later on we’ll also address other reasons why Podcasts may not be downloading on your iPhone. Can I Use Cellular Data To Download iPhone Podcasts? Yes! If you want to download podcasts using cellular data, turn off the switch next to Only Download On Wi-Fi in Settings -> Podcasts. A word of warning: If you turn off Only Download On Wi-Fi and have automatic podcasts downloads turned on, there’s a chance your iPhone could use a significant amount of data downloading new episodes of all of your podcasts. That’s why I recommend leaving Only Download On Wi-Fi turned on — you could wind up with a big surprise the next time you get a bill from your wireless carrier. 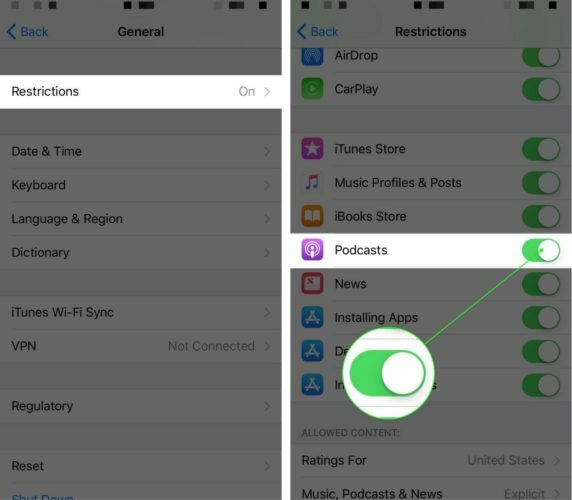 Your iPhone won’t be able to download podcasts on your iPhone if Airplane Mode is turned on. Open the Settings app and tap the switch next to Airplane Mode. You’ll know Airplane Mode is off when the switch is white and positioned to the left. 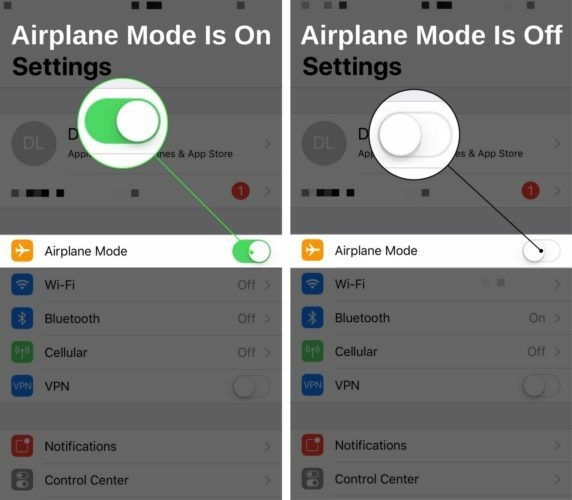 If Airplane Mode is already off, try toggling it on and back off again by tapping the switch twice. A lot of the time, minor software glitches can interrupt your iPhone’s connection to Wi-Fi. If it isn’t connected to Wi-Fi, your iPhone might not be able to download podcasts. One quick way to try and fix minor software Wi-Fi problems is to turn Wi-Fi off and back on. This will give your iPhone a fresh start, as it can try to connect to your Wi-Fi network again. Go to Settings -> Wi-Fi and tap the switch next to Wi-Fi to turn it off. You’ll know Wi-Fi is off when the switch is white. Wait a few seconds, then tap the switch again to turn Wi-Fi back on. If toggling Wi-Fi off and back on didn’t work, try forgetting your Wi-Fi network entirely. That way, when you reconnect to the network afterwards, it’ll be as if you’re connecting to the network for the very first time. 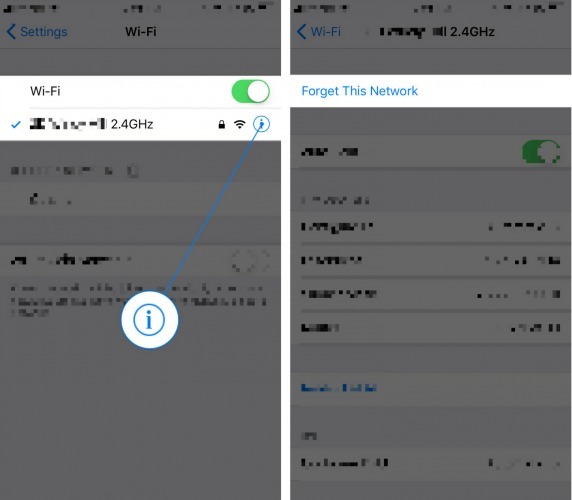 If something changed in the process of how your iPhone connects to your Wi-Fi network, forgetting the network and reconnecting can usually account for the change. To forget the Wi-Fi network, open the Settings and tap Wi-Fi. Then, tap the information button (the blue “i” in a circle). Finally, tap Forget This Network, then Forget when the confirmation alert pops up on the screen. Once the network has been forgotten, it’ll appear under Choose A Network. Tap on your Wi-Fi network, then enter your network’s password to reconnect. Go to Settings -> Podcasts -> Download Episodes and select Only New or All Unplayed — either option will download episodes of your podcasts when they become available. 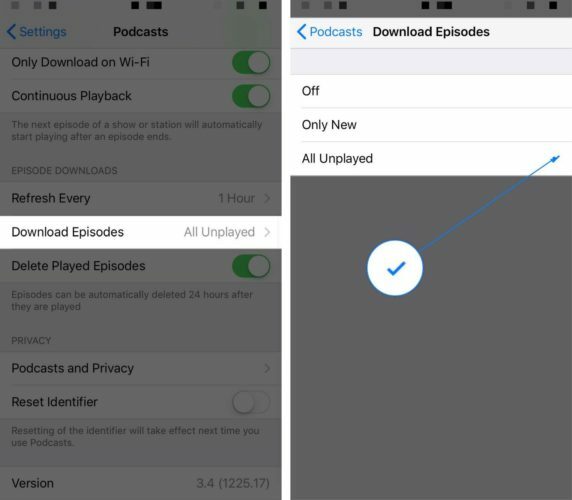 However, if Off is selected, your iPhone won’t download podcasts automatically when they become available. 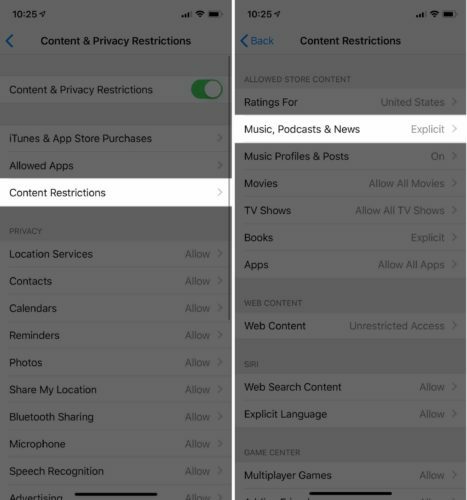 Restrictions are essentially your iPhone’s parental controls, so if Podcasts was accidentally turned off, you won’t be able to download them. 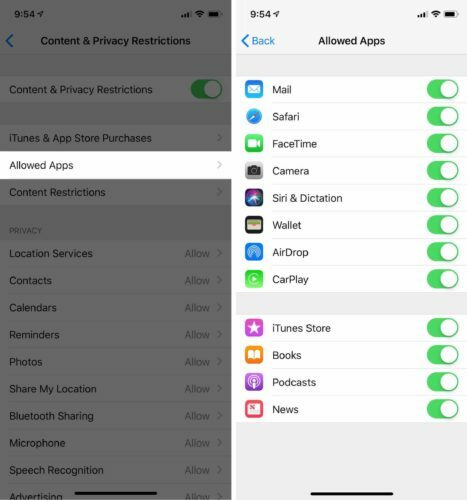 Open Settings and tap Screen Time -> Content & Privacy Restrictions -> Allowed Apps. Make sure the switch next to Podcasts is turned on. If you’re trying to download and Explicit podcast, head back to Settings -> Screen Time -> Content & Privacy Restrictions and tap Content Restrictions. Under All Store Content, make sure Explicit has been selected for Music, Podcasts & News. Go to Settings -> General -> Restrictions and enter your Restrictions passcode. Then, scroll down to Podcasts and make sure the switch next to it is turned on. If you’ve made it this far, you’ve worked through the more basic troubleshooting steps when podcasts are not downloading on your iPhone. Now, it’s time to address more in-depth potential problems. Although iOS apps are strictly vetted, they can still run into problems from time to time. When you’re experiencing problems with an app, deleting and reinstalling the app will usually fix the problem. It’s possible that podcasts are not downloading on your iPhone because a software file within the Podcasts app has become corrupted. We’ll delete the Podcasts app, then reinstall it like new! 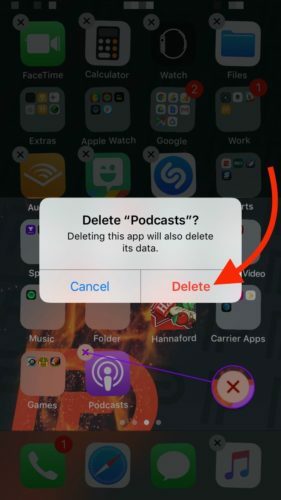 Don’t worry — you won’t lose any of any of your podcasts by deleting the app on your iPhone. First, delete the app by lightly pressing and holding the app icon until all of your apps begin to shake. Next, tap the small X that appears in upper left-hand corner of the app icon, then Delete. Now that the app has been deleted, open up the App Store and search for the Podcasts app. Once you’ve found it, tap on the small cloud icon to its right to reinstall it. When you open the app, you’ll find all of your podcasts still there! 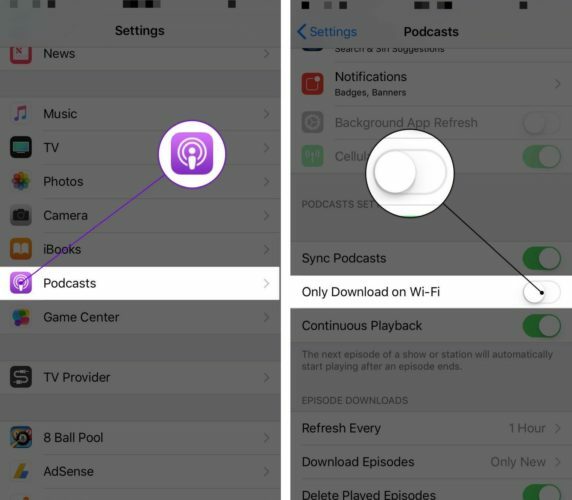 If a poor Wi-Fi connection is the reason why podcasts are not downloading on your iPhone, try resetting your iPhone’s network settings. This will reset all of its Wi-Fi, Bluetooth, Cellular, and VPN settings for factory defaults. When you connect to a Wi-Fi network after resetting network settings, it’ll be like you’re connecting to that network for the very first time. This completely fresh start will often fix the software problem that prevented your iPhone from connecting to Wi-Fi in the first place. Note: Before resetting network settings, make sure to write down all your Wi-Fi passwords, as you’ll have to reenter them after the reset is complete. 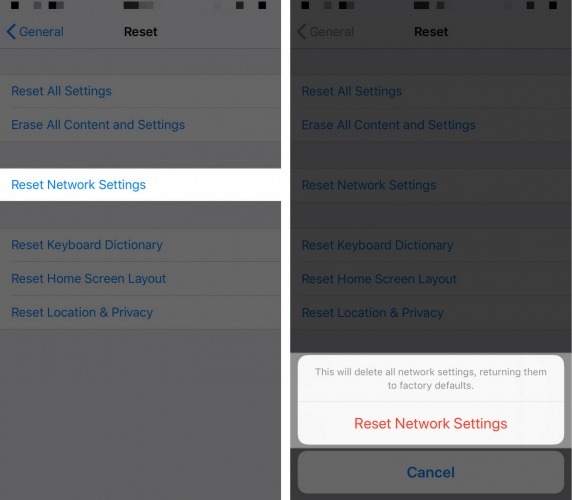 To reset network settings on your iPhone, go to Settings -> General -> Reset -> Reset Network Settings. Enter your iPhone’s passcode, then tap Reset Network Settings when the confirmation alert appears on the screen. 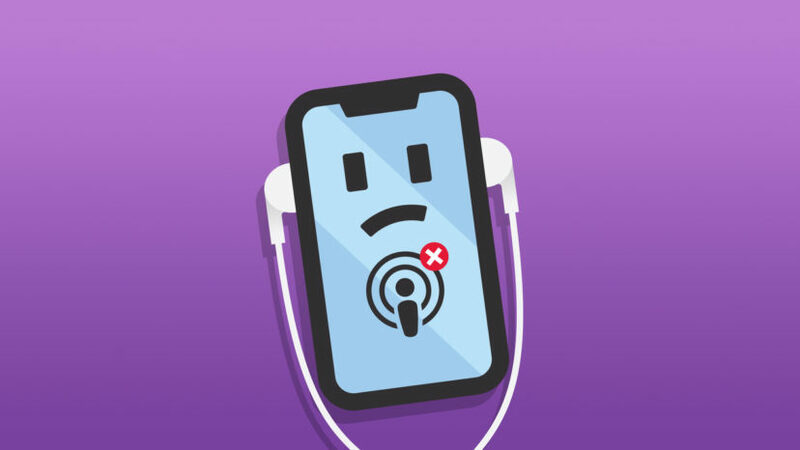 If Wi-Fi problems are still preventing you from downloading podcasts on your iPhone, check out our article on what to do when Wi-Fi isn’t working on your iPhone. The final software troubleshooting step is a DFU restore, which will erase all and reload every bit of code on your iPhone. This step is a bit drastic when podcasts are not downloading on your iPhone, so I’d only recommend doing it if you’re experiencing many other software issues as well. If you feel as though a DFU restore is the right option for you, check our article to learn how to put your iPhone into DFU mode. 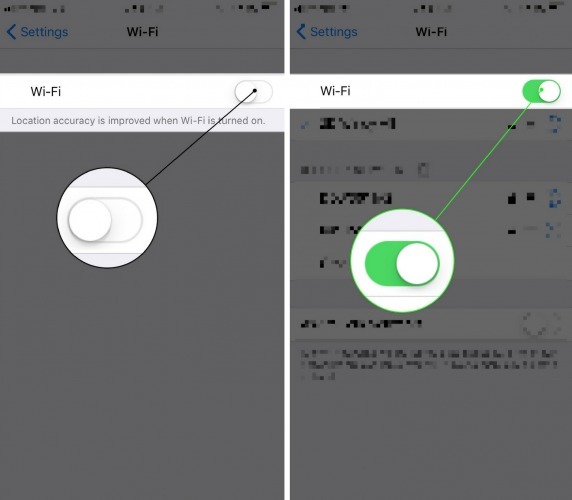 Although it’s very unlikely, it’s possible the Wi-Fi antenna inside your iPhone is broken, which is preventing it from connecting to your Wi-Fi network. This same antenna connects your iPhone to Bluetooth devices, so if you’ve experienced lots of issues connecting to both Bluetooth and Wi-Fi recently, the antenna could be broken. If your iPhone is protected by AppleCare+, I’d recommend scheduling an appointment and taking it into your local Apple Store so a member of the Genius Bar can take a look at it and determine whether or not the antenna is actually broken. I also highly recommend Puls, an on-demand repair company that will send a certified technician directly to you. They’ll fix your iPhone on the spot, and that repair will be covered by a lifetime warranty! You’ve successfully fixed the problem with your iPhone and you can start listening to your podcasts again. Next time podcasts are not downloading on your iPhone, you’ll know exactly how to fix the problem. If you have any other questions, feel free to leave them below in the comments section! Next Article Do Not Disturb While Driving: iPhone Safety Feature Explained!